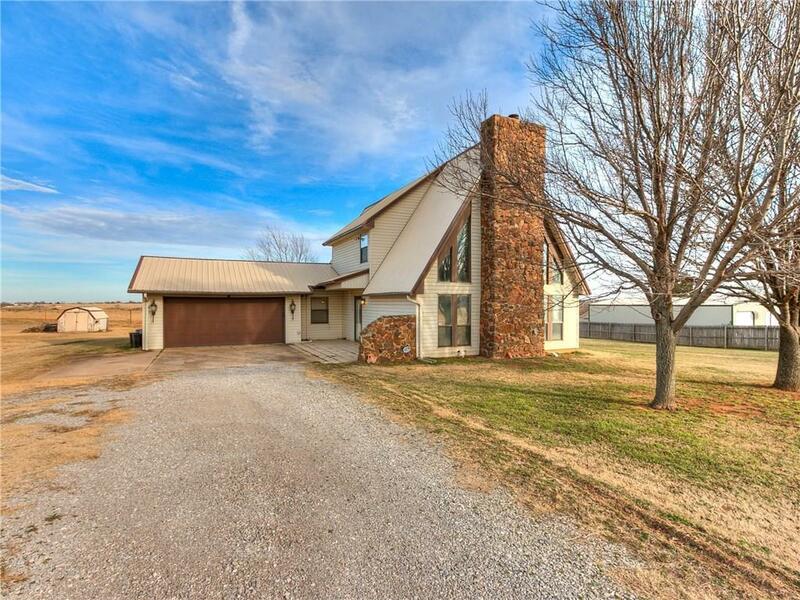 Come home to this beautiful A-Frame home just 1/4 mi out of Chickasha city limits with a metal roof & sitting on 1 acre! Home includes upstairs master with walk-in closet, bathroom and an open loft giving a second living area overlooking the main and a relaxing balcony. On the main level a large living area with a 32 foot rock fireplace, kitchen with pantry, dining area with sliding doors to the patio and an over sized laundry with outside access to the 2 car garage. Beautiful chandeliers adorn the entryway, the stairwell and dining area. Outside you will find an additional spacious back deck, small chain link fenced area for dogs and a 8'x16' tool shed/shop out back. Privacy fence along one side of the property. Choose between Chickasha or Pioneer schools. LOTS OF ROOM & ENDLESS POTENTIAL!